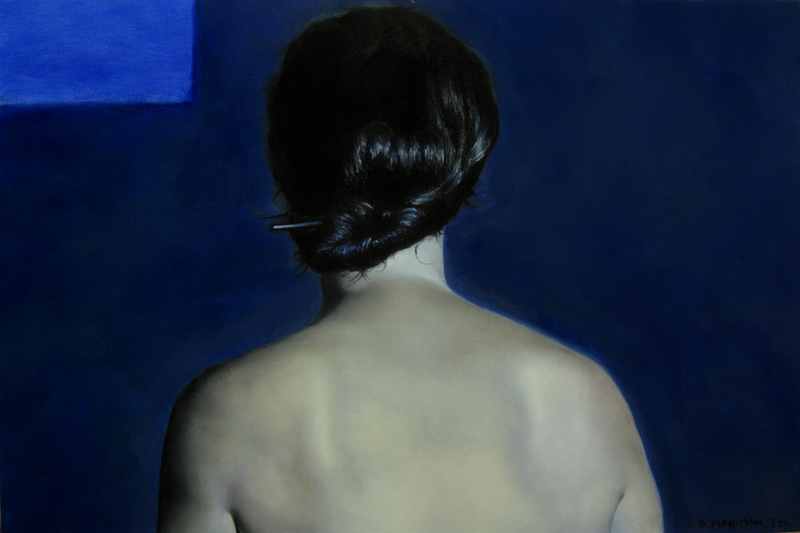 Blue Leah #4, 2011, oil on canvas, 24"x36"
I hardly ever paint the back of the head, face-addict that I am. But the back of the head is expressive too. Its language may not have so many words as the front, but they are powerful words, and different from the words of the face. I am gluttonous for contact. I like to establish a connection with the people around me. The vocabulary of the face on the theme of contact is larger than that of the back of the head. The language of the back of the head tends toward lack of contact; a connection broken, or not yet established. It is a language of few words, but its words have multiple meanings. The back of the head, brought to the focus of a painting, carries ambiguity. Pursuing the logic of rotation in my Blue Leah series, I came upon the back of the head, and decided to follow the logic here too. The ambiguous psychology of the faces in the paintings eclipsed all of the available certainties when she faced away from me. You know me - I'm something like a scientist. Like scientists, I want to know. It was not easy for me to decide to paint the back of Leah's head. There was something heartbreaking about it for me; a tragic sense, deriving from the idea that all time is time that can be spent getting to know. If we don't optimize our means of knowing, then the time we spend in this inferior state is time we don't get back. There are six hours of time lost in this painting, knowledge I will never again have time to uncover. Nobody will. The goal of the back-of-the-head painting cannot be knowledge; it must be a willing entry into a state of unknowing, or of limited knowing. The enjoyment of, or benefiting from, this ambiguous state, this ignorant state, must be its own reward. There is no other meaningful door to the painting of the back of the head. The compositions, the range of colors, the angle and quality of light, all are nearly identical. In neither case is the figure explicitly aware of the viewer, or looking at the viewer. 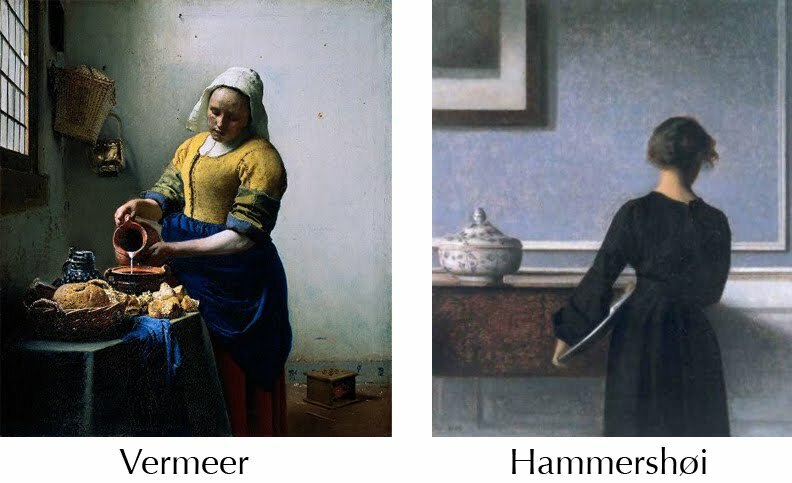 But Vermeer's kitchen maid belongs to us, and we to her. Such is the force of the human face. It binds us. 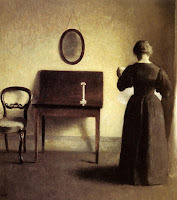 By contrast, Hammershøi's young woman does not belong to us, and we might not belong to her. Hammershøi made quite a career of painting women in rooms facing away from the viewer. We learn from the teachings of Wikipedia that a great many of these women are his wife Ida, painted at home, an apartment at Strandgade 30, Copenhagen. There seems to me a kind of scorchingly Scandinavian quality to this fact. If Vermeer represents a fulcrum between the warmth of the southern part of Europe and the chill of the north, Hammershøi uses Vermeerian artistic instruments to do for painting what Strindberg does for theater, Kierkegaard for philosophy and Bergman for film. He brings the cold: buttoned up in its presentation and anguished in its soul. What I see here is a sense, not only of muteness, but of being trapped in a labyrinth. The labyrinth consists of those rooms within rooms, each tending toward darkness, each penetrated to some extent by a chilly daylight. The exterior is glimpsed, or unseen; going outside is no longer an option. Life is a matter of transit and rest between rooms, and contact between occupants is impossible. They share a domesticity but their distance is unbridgeable. 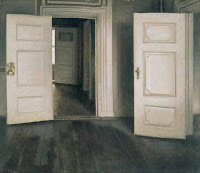 I think of Hammershøi's world as a completely determined world. The orchestration and depiction of elements is so meticulous that all parts of the image must be understood as meaningful. Nothing here happens by accident. The sitter is not turned away from us by accident, but rather by necessity. It is essential to her nature and her relation with the viewer. It is so essential that we cannot assume she has a front side. She is existentially turned away; she has no face, she cannot have a face. In this house of creaking floors and ticking clocks, perhaps of sounds of traffic coming muffled through the windows, she is a monster of solitude. Theseus and Minotaur alike have long since wandered off. We are alone with dust and floorwax and quiet. Kaapcke has a body of work devoted to the backs of heads. But consider here how contingent the back-of-headness is. The head is full of detail, motion, vitality. It is turned away, but this turn is a gesture; it could change at any time. This person has a face, we just can't see it at the moment. Again, we have a glimpse of an individual swimming in a world of chance and change. Look at the idiosyncrasy of the bumps on the skull, the vivid hard light. This is just the same as a portrait, only the person happens to have turned for a second as the viewer was stumbling in. Ida is reading a newspaper now. Perhaps we want to say something to her, but she will not hear, and never turn. She cannot. And we cannot make her. There is nothing on the other side. She is settled, as still as a statue; the gestures of marriage have ossified, stiffening from total comfort into total alienation. But her vanishing is as absolute as her turned-awayness. Once she is gone, she is always gone, has always been gone. The quiet pounds in his ears. This is the important part: the quiet pounds in our ears as well. Hammershøi the man suffers intimations of grief, of distance, of longing, and of menace. Hammershøi the philosopher sees a metaphysical necessity in the sensations of the man. 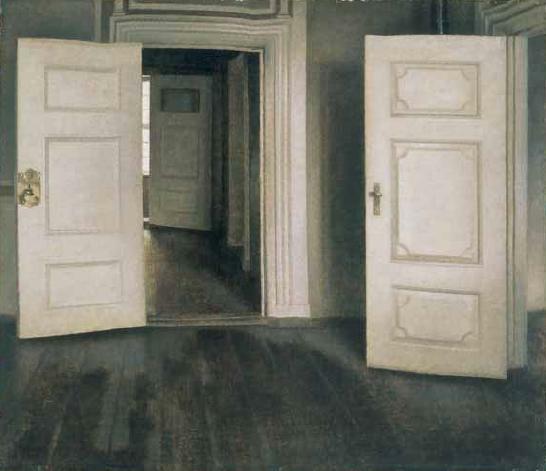 But Hammershøi the artist records and transmits this universe. He overwrites our own universe, he compels us, so long as we are trapped before his paintings, to participate in his loneliness. This is a triumph of art as communication. I will not trouble you with any sentimentalisms about Hammershøi transcending his solitude by communicating it to us. There is no redeeming communication here, only the revelation of one of the thousand faces of the truth. 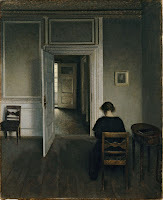 Hammershøi remains alone, and through his masterful communication, we are now alone as well. His artwork is a trapdoor into his labyrinth. It should come as no surprise, then, that if Kaapcke's contingency represents one end of the back-of-head spectrum, and Hammershøi's essentialism the other, I fall closer to Hammershøi than to Kaapcke. Of course I do; I do not paint that which might be otherwise, because I have no talent for perceiving alternatives. To perceive an alternative is to engage in hierarchical thought, and I do not think hierarchically. My hierarchical sense is flattened, I do not prioritize or sort. My eye consumes my mind; whatever is in front of me is all. In my universe, what is collapses into identity with what must be. Reasoning thus on the back of the head, I see that what I've done with Blue Leah #4 is to artificially overlay a hierarchy on my simplistic value system. I favor faces because the maximum of ready information and connection lies in faces. The informational transaction between an external object and a viewer is one of the major loci of art. It is my native stomping ground. Contrariwise, the detachment of the viewer - the self - from the external is another major locus. This is the art of self-travel, self-discovery (or at least, it is more directly so than externalized art). To explore this vast inland, the exterior world must often be dampened, as Hammershøi dampens; or replaced with semiotics, as the expressionists and symbolists replace. I have imposed hierarchy in this painting by dampening my connection with the exterior. 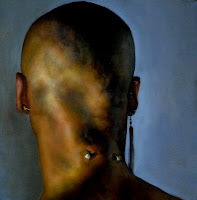 Painting the back of the head does not, ultimately, result in a low-information image. It results in an image where the information is dug up from the viewer, not transmitted from the model. This is a harrowing and difficult sort of excavation, and it takes restraint and self-discipline even to ring the doorbell of Strandgade 30. But it is an appointment worth keeping. Note: with many thanks to Karen Kaapcke for her kind permission to reproduce her beautiful paintings here. You can see more of her work here. Backs of heads can be fascinating, and I am glad you found the exercise useful - it certainly resulted in a lovely painting. 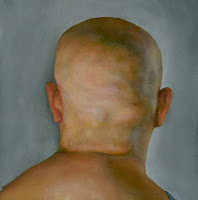 For me (and I seem to be quite good at selling paintings of backs of heads!) it is a natural extension of my fascination of the interaction between character and momentary mood - I feel that the back of the head shows character quite strongly, as this affects long term decisions such as posture and hair cut/colour etc. Without the distraction of short term mood this can be seen and appreciated more fully. 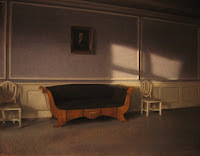 Certainly Hammershøi managed to communicate character - although he did, of course, use the surroundings to help him, in a way neither I nor you have done. There is also an intimacy to knowing well a back of the head - the one I know best is my husbands, as I don't have the need to talk to him all the time in the way that you do with less familiar people. Being together, but not necessary talking, is quite a privilege . . . Your thoughts on character versus mood are very interesting! Thanks for sharing; you remind me of Degas's nuanced observation of the relationship between occupation and posture. And your contrasting perspective on the meaning of the back of the head in the context of a long-term relationship is also much appreciated. Obviously, my instinctive emphasis is different, but I can see the legitimacy of what you're saying, and I'm grateful to hear it because it would never have occurred to me. I hope your painting is going well! Hey, Degas is one of my top fives! So I'm very flattered . . .
One of the point of having a blog is to read things that wouldn't have occurred to you, for me at least. It goes a ittle way to missing out on all those discussions with other art students I never had. Painting is going very well - why I've been slow to reply - a trip to Amsterdam (and seeing some Degas and Rembrandt self portraits) really made me see how to do something. Jane - I love Degas too! Sadly, my dad lumps him in with Renoir. Renoir! It is very nice to read things I wouldn't have thought of; my readers correct me or expand my understanding all the time... I didn't talk with art students either, although I am lucky enough to know some artists here in New York. I'm glad painting is going well, and envious of your trip to Amsterdam. Most of the Rijksmuseum was closed when I was there too. Are they ever going to reopen that damn thing? How did he *do* that?